As an educator in Middle school for over a decade I have been actively creating math projects. I also at times run out of ideas and am always looking for collaboration. I figured this out a few years ago when on a learning team about Math and again recently when I changed jobs and now have the chance to discuss ideas with my partner. Through the discussion new projects are created. My idea here is to post different projects that I have created but hope that others will post there ideas as well. My first post is a new idea that my partner and I recently put together. The idea revolves around students designing a Las Vegas style hotel. See the Criteria Sheet I put together and make comments if you wish. If you use the idea, it would be great to see the results of what you did. We have not used this idea yet but it is going to be our next project. 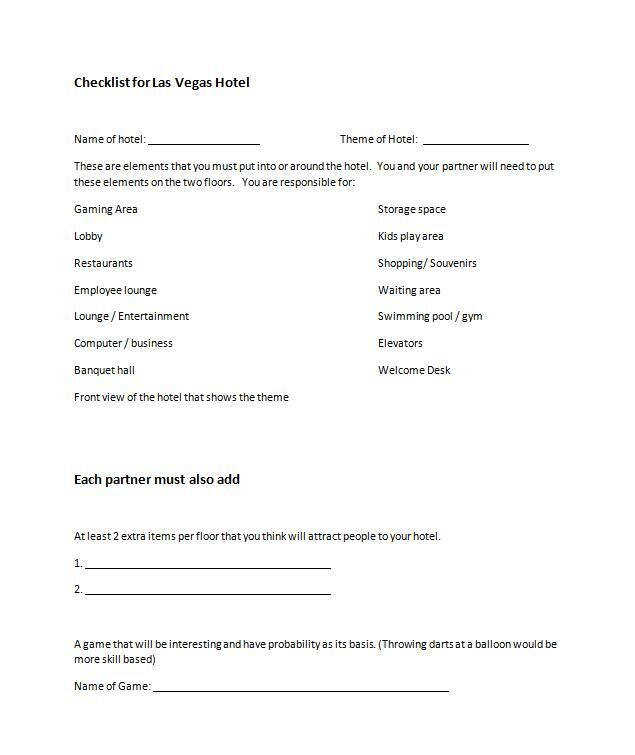 Feel free to change anything in the project, we are hoping to have the students build there hotels with either foam board or cardboard and then have a Vegas type day where the students have a chance to go to the hotel and play some of the games there. We will hopefully make a miniature Vegas Strip for kids. I will try to post some pictures when the project is done. Las Vegas is mainly a city for adults but recently developers want more families to come and have a good time. Your job is going to be to design and build a hotel that will be for kids. 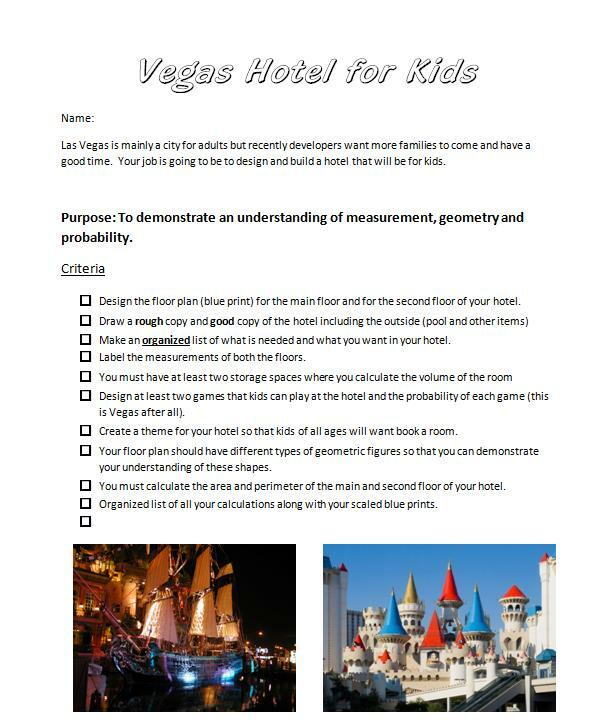 Purpose: To demonstrate an understanding of measurement, geometry and probability. □ Design the floor plan (blue print) for the main floor and for the second floor of your hotel. 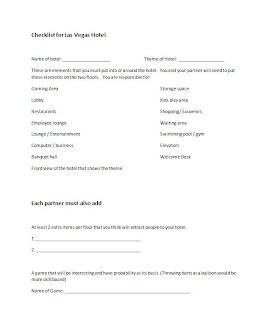 □ Make an organized list of what is needed and what you want in your hotel. □ Label the measurements of both the floors. □ Design at least two games that kids can play at the hotel and the probability of each game (this is Vegas after all). □ Create a theme for your hotel so that kids of all ages will want book a room. □ Your floor plan should have different types of geometric figures so that you can demonstrate your understanding of these shapes. □ You must calculate the area and perimeter of the main and second floor of your hotel. □ Organized list of all your calculations along with your scaled blue prints. At least 2 extra items per floor that you think will attract people to your hotel.